Frederick Memorial Hospital (FMH) maintains a focus on delivering quality care. FMH reached out to Graphcom for help to acquire new donors and cultivate existing ones by sending a fundraising appeal letter to prospects throughout Frederick County. The appeal was designed to raise money to build a new cancer center. Based on our recommendations, the letters were sent to Frederick County residents with an annual household income of $80,000 or more, regardless of whether they had an existing relationship (donor or volunteer) with FMH. Although the hospital had raised funds through appeal letters before, the results were lackluster. Some mailings had cost more money than they had made. Letters were created in a newsletter style, in which readers were required to open several folds to get the entire message. They were printed with only two colors, which gave the pieces an outdated look. Messaging was staff-centric, without enough emphasis on what the benefit to the donor might be. Acquisition efforts were launched only once per year and were limited to a different quadrant of Frederick County each year. For this new appeal, the client defined “success” as acquiring any new donors, provided that the funds raised were at least equal to the cost of launching the campaign. Our goals were to increase awareness of the cancer center initiative throughout the community, broaden FMH’s donor base, and (of course) to raise funds. 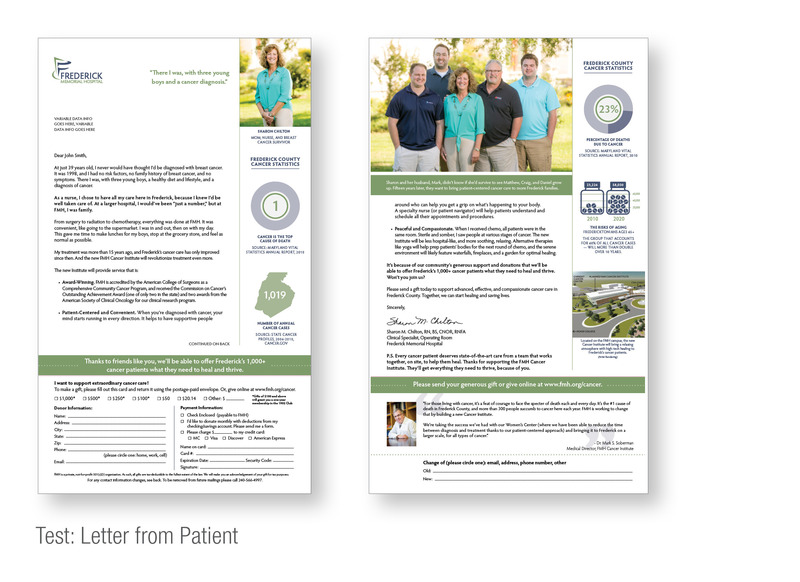 We determined that because these letters would be sent to the entire community—not just previous patients and their families—it was important to appeal not only to people’s emotions but also to their sense of logic. In other words, we needed to make a strong case for improving cancer care in the Frederick community, both with storytelling and with hard data. To that end, a powerful narrative was combined with strong, impactful images to evoke emotion. At the same time, we researched cancer data in the community and included infographics for quick “at a glance” facts. 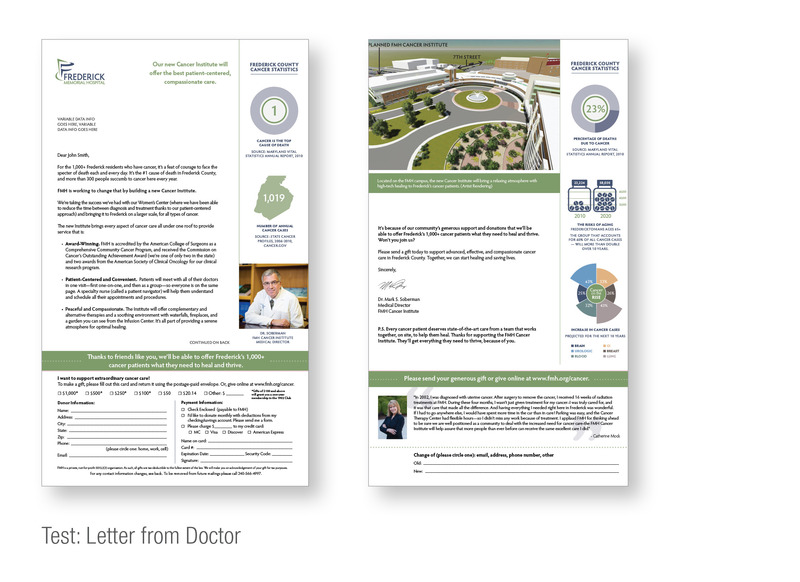 For every dollar FMH spent to produce these donor appeal letters, they earned $2.95 in return. We tested an envelope with a standard return address from the hospital against an envelope with a teaser. The standard envelope beat the fancy one by 29%! 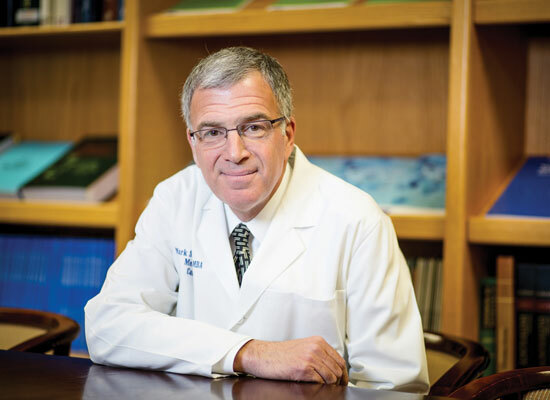 One version of the letter was written by Dr. Soberman (pictured at left), who heads the cancer center. The other version of the letter came from a female cancer survivor and nurse with a family. Dr. Soberman’s letter enticed 46% more donors to give. Graphcom can help you take your fundraising appeals to the next level.